Set in a former Carmelite convent and arranged around the cloister, the Jules César is a charming 5-star hotel that combines 18th-century features with contemporary art. 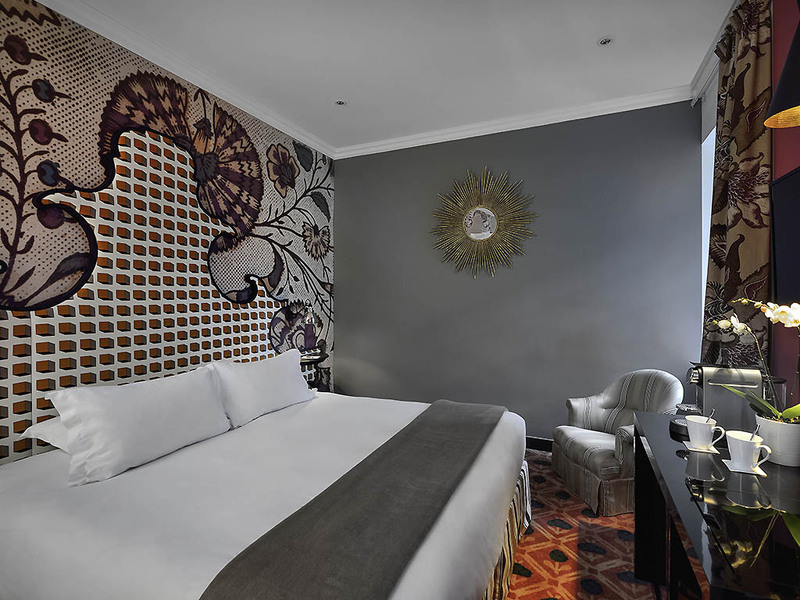 Fully renovated between late 2013 and early 2014 by the grand master of fashion Christian Lacroix, the hotel cuts an imposing figure and is full of surprises. 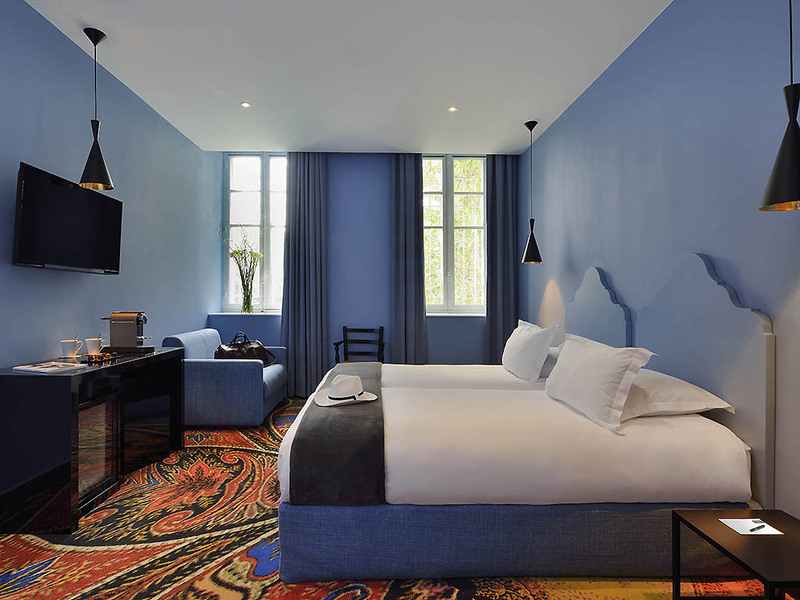 A bright, sunny hotel with décor based on a different theme on each of the hotel's three floors: 18th-century Provence with reference to Raspal's Arlésienne; the Camargue region; and the chromatic style of Christian Lacroix. Stay in the heart of town, just steps from the amphitheater, to discover Arles by foot. From the relaxation area to the gym, personalized treatments and luxurious wellbeing await. Try our chefs' creations, endorsed by the renowned Michelin and Gault & Millau travel guides. For a totally original way to explore Arles, we suggest trying the "vélo-taco" bike tour by Taco and Co. The tour is a practical and environmentally friendly way of visiting the city center's pedestrian and tourist streets. The guided tour, in both French and English, lasts around 1 hour and includes a snack break during the ride. It's a fun, original and unforgettable way to explore the city! While it is recognized around the world as the city where Van Gogh once lived and painted, Arles is also renowned for its historic heritage and major art festivals and events. After all, a city doesn't earn UNESCO World Heritage listing for nothing. From Nîmes or Marseilles: A54 in the direction of Arles. Exit no. 5 Arles-Centre, follow signs for Bvd Clémenceau then for Bvd des Lices. The hotel is located on the right after the tourist office and carousel. From the Marseille-Provence airport: Exit Salon de Provence on the A54/E80 then follow signs for Arles. The Saturday market impedes access via Bvd Clémenceau until 3pm. We advise you go to the police station and ask to take Bvd des Lices. Valet service is EUR 20 per day. The hotel offers three room categories: Classic, Superior or Deluxe. Each one is unique and reveals the soul of its fashion-designer creator. The colors and materials are true works of art offering design and magic in equal measure. 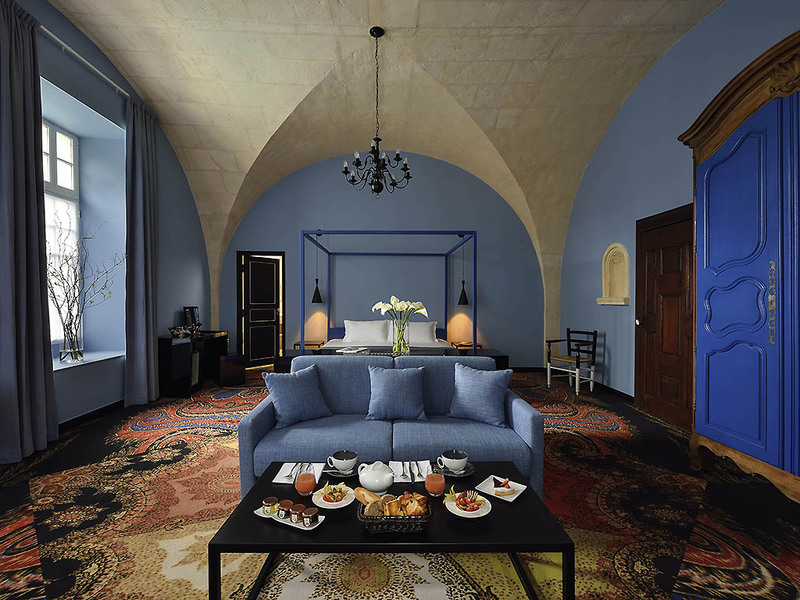 The Lacroix Suites and Junior Suites each boast one of three personalized decoration themes by the grand master of fashion: Lacroix, Provençal or Monastic. Each Suite can accommodate 2 to 4 people and has the option of adding a crib. Lacroix's flamboyant style is found in each room. 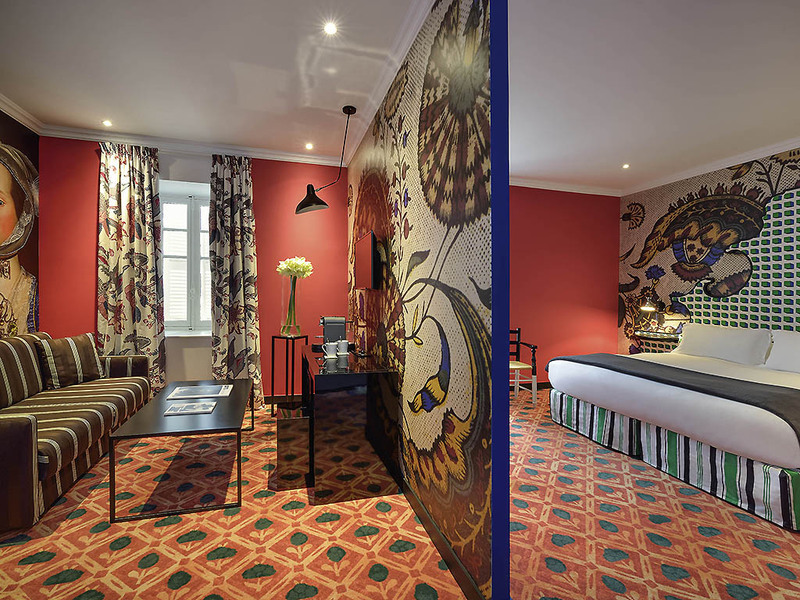 Admire the fresco - signed by the designer himself - in the vermillion suite, devoted to bullfighting. Under the vaulted ceiling of the blue apartment, the marble bathroom provides heavenly relaxation. 161-205 sq. ft. (15-19 m2) rooms with double bed. Bathroom with shower or bathtub. Modern decor completely renovated at the beginning of 2014. Tea and coffee making facilities, minibar, Nespresso machine. Satellite TV. Free WIFI. 237-280 sq. ft. (22-26 m2) rooms with double bed (queen or king size). Bathroom with shower or bathtub. Modern decor completely renovated at the beginning of 2014. Tea and coffee making facilities, minibar, Nespresso machine. Satellite TV. Free WIFI. 280-344 sq. ft. (26-32 m2) rooms with king size bed. Bathroom with shower or bathtub. Modern decor completely renovated at the beginning of 2014. Tea and coffee making facilities, minibar, Nespresso machine. Crib available. Our 323-420 sq. ft. (30-39 m2) Junior Suites are all unique, decorated in either Provençal or Monastic style. The colors, patterns and fabrics are specially compiled to create a magical luxury design. Measuring 431 sq. 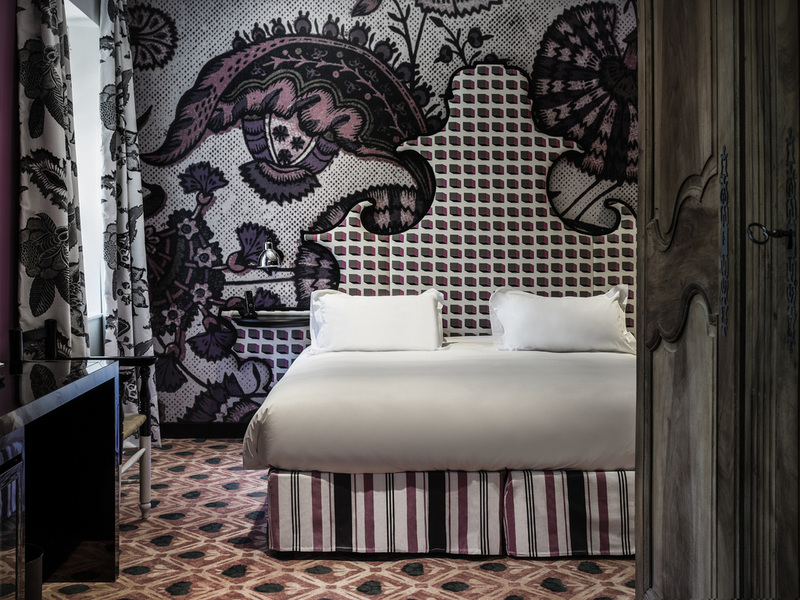 ft. (40 m²), our Lacroix Suites unveil the unique talents of Christian Lacroix, the grand master of fashion. Lounge area and bathroom with bathtub or shower. Signed by chefs Pascal Renaud and Joseph Kriz, the dishes are reinvented throughout the seasons and are staged as true creations. The meal is finished with great finesse and on a sweet note with a dessert by chef Anne Beyl. Located in the heart of the hotel, "Le Jules" bar offers a wide selection of drinks, including the famous "Cocktail de Madame Lacroix", as well as tapas and pastries. The bar also offers various events throughout the day. On sunny days, the terrace is a privileged setting for gourmet appetites. After a refreshing swim, enjoy cocktails and snacks on a sunlounger. A chic bistro at lunchtime, the Lou Marquès serves refined gourmet meals in the evenings. The Hotel Jules César can host all your private receptions in Arles, from wedding receptions to more intimate events. Greet your guests in the unique setting of a majestic room, the lush Mediterranean garden, the outdoor swimming pool or one of the exceptional suites. Treat yourself to an unforgettable experience. Equally perfect for professional events, the Hotel Jules César offers five exceptional fully equipped reception rooms. Residential seminars and study days can also organized in complete privacy. Whether you wish to celebrate a wedding, a civil ceremony, a birthday, host reunions for family or friends, the hotels in the the MGallery collection offer guests a unique and unforgettable experience in a spectacular setting. Opening hours : The spa is open daily from 10am to 7pm. The heated outdoor swimming pool, open seasonally, is found in the heart of the lush green garden. Towels are available at the side of the pool. Some hotels in the collection boast exceptional locations within close proximity to a golf course. Guests are sure to recharge their batteries in the heart of nature.